Give me your children and I’ll change society in ten years. Please assist us, as despite most of us remember hearing this phrase or one very close, none of us could even venture a guess to who, what, when or where. Suffice it to say that something similar to this was said by somebody notable enough for us to remember having read, heard or dreamt it. In the United States, the children in question are school age and especially university age children where in all too many of these institutes of higher education there are safe spaces and speech codes where to even be accused of transgression is a guilty verdict. Where you have speech codes, you lack free speech, and it is that simple. The actual basis of the concept behind free speech is the guarantee that everybody, and it means everybody, can say what is on their mind about anything free of fear that saying so will result in criminal charges and the only possible repercussion would be possible loss of friends and a tainted reputation. That is free speech. It is not free speech if all you ever need hear are opinions with which you agree, or worse, you only get to hear what others have defined as acceptable speech, especially if these are also the same people who hold your future in their hands and within their gradebooks. Unfortunately, for all too many of American university students, the entirety of the above sentence is their reality day in and day out. Numerous of the leading and most prestigious universities such as many of the California University System, all too many Ivy League Colleges and too many other all too well known and sought after universities, there are speech codes, safe spaces and other politically stifling inventions which are being used by the leftist administrators and professors to control the environment while programming the minds of mush sent them presumably to be educated to think, not programmed what to think. The combination of speech codes, safe spaces and unipolar faculty all supporting a singular political bend and the end result is so easily predictable. When speech codes are designed to support such concepts as global climate change (global warming) is fact, Palestinian Arabs dispossession, anti-capitalism, racism in American society, transgender rights, sexism and other leftist viewpoints and suppress any counter viewpoints combined with reinforcement from curriculum and safe spaces to turn to to escape any transgressions of the speech code or anything which might upset a student’s sensitive psyche and you end up with a host of programmed leftist social justice warriors turned loose each year on society and eventually they will change their world. And just in case you might be wondering, that is exactly the intent of the combination of programming tools being implemented at too many American universities. They take a variety of inexperienced, young students whose minds have yet to experience the realities of life in the real world and place them in an environment where everything is arranged such that only leftist, socialist, progressive political concepts are permitted and provided as accepted truth without allowing for any opposing viewpoints and after four to ten years of such programming send out little leftist, Marxist mind-numb robots all set to correct the world and repair all inequities using the knowledge given them. Amongst the forty-five declared goals for the Communist takeover of America is to, “Get control of the schools. Use them as transmission belts for socialism and current Communist propaganda. Soften the curriculum. Get control of teachers’ associations. Put the party line in textbooks.” They can check this one off their list as the leftists have all but taken complete control of the textbook industry and the teaching institutions and teaching curriculum. The only viewpoint which, in the United States, is challenging the pure leftist agenda has been the Arabist Islamist viewpoint with an intensified curriculum of anti-Israel, anti-Zionist and soon to follow on, anti-Semitic viewpoint. On many campuses, the leftist and anti-Israel, anti-Zionist viewpoint and instruction have merged so seamlessly that in politics as a whole, the two have become partners in trade for numerous leftist groups to adopt anti-Israel, anti-Zionist views as a natural extension of their political viewpoints. In order to make such an environment and assure that the little mushballs entrusted to them in many universities, they have implemented the concept of speech codes which completely support the curriculum such that none ever have to hear a discouraging, or contradictory, phrase. In the classroom, the students quickly learn that to disagree with a professor’s political views risks failure or more critical grading at the least making receiving honor level grades a student adopts the professor’s political views as their default thought process. After a number of years, the higher the degree, the longer the years and the deeper the indoctrination and the longer a student adopts the leftist viewpoint, the more rote repetition of the specific political points held within, the higher the likelihood that the student adopts these views as their own out of habit and repetition. Of course, that is the intended result the professors are seeking from these general soft-sciences and social sciences curriculum as the textbooks and teaching staffs bear witness. So, what does this hold for the United States and the future? Well, presuming that nothing is going to change, then the United States will continue sliding further and further left until some future President Obama will be the conservative candidate. Before somebody screams that, there will be a corrective slide which would prevent such, let us say that we can only hope that they are correct. The problem we have is after over a half-century of observing the world political stage, and the United States in particular, since the mid-Twentieth Century, there has been a steady and continuous with an occasional lurching back to the right which was all but immediately erased by the next leftist to be elected. As so many have attempted to point out, President John F. Kennedy in the 2000 elections would have run as a Republican with his agenda of lower taxes and building the military. Of course, what these exclamations ignore is that from the 1960 election to 2000, candidate John F. Kennedy would have endured forty years of the Washington Post, New York Times, mainstream broadcast television and all too many other leftist pressures that he very well might have been an entirely different President elected at the turn of the century and would not have run a campaign the equivalence of George W. Bush in 2000, he would have been a more electable version of Al Gore. But fear not, if social media and the uproar caused by the election of President Trump, no true history of conservatism, by an overwhelming number of youthful political enthusiasts, the educational programming is working efficiently and producing an enthusiastic force within American society. What will the future hold? That will not be difficult to tell. One quick measure might be the above graph of the national debt by year. Up until 1960, the debt grows very slowly and then takes off with a short respite in the late 1990’s before continuing upward. This has been due to ever increased social spending brought on by both main parties with the sole respite coming when the Republican Congress forced a government shutdown under the leadership of Newt Gingrich and his Contract with America where the budget was briefly balanced. Still, even then, it was but a brief respite brought on by a conservative correction, something that was not managed even under President Reagan. The ever-increased debt has resulted not only from the initial Great Society initiated by President Johnson but the ever-added amounts and increased numbers of programs which have pushed the debt ever higher. The final number in 2007 was around nine-trillion and now a mere ten years later at the end or 2017 and the debt is now at twenty-one trillion dollars, a doubling and then some in a mere decade. 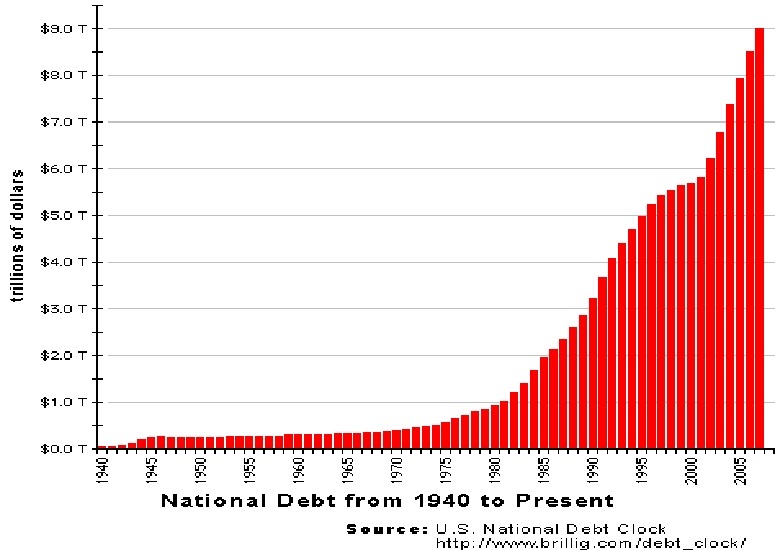 Should the United States debt continue to climb as such and it will clear one-hundred-trillion by mid century assuming things are not brought under control and the ever-continuous slide towards socialism turned back. Does it appear that this might be the case? Well, in all honesty we fear the United States will spend itself into oblivion before it learns its lesson as every other attempt at socialism has resulted in the same end. That is a truly frightful realization and one can only hope that the United States is scared from failing while it might still be possible to produce their way back to solvency. It will take an extended effort and the electorate changing direction aiming to bring government under control, spending back within limits and fiscal discipline which has not been seen in over half a century. What the United States needs is four or five President Andrew Jacksons in a row as he was the last President to ever pay off the national debt completely, and he only managed to do so for a few months.